Note: check back later for full update (I just like to post my weight first thing in the morning). I am dressed like a ninja. Exercise: Ran 3.13 miles in 33 minutes. How come I’m so slow? Is it fair for me to blame the cold weather? 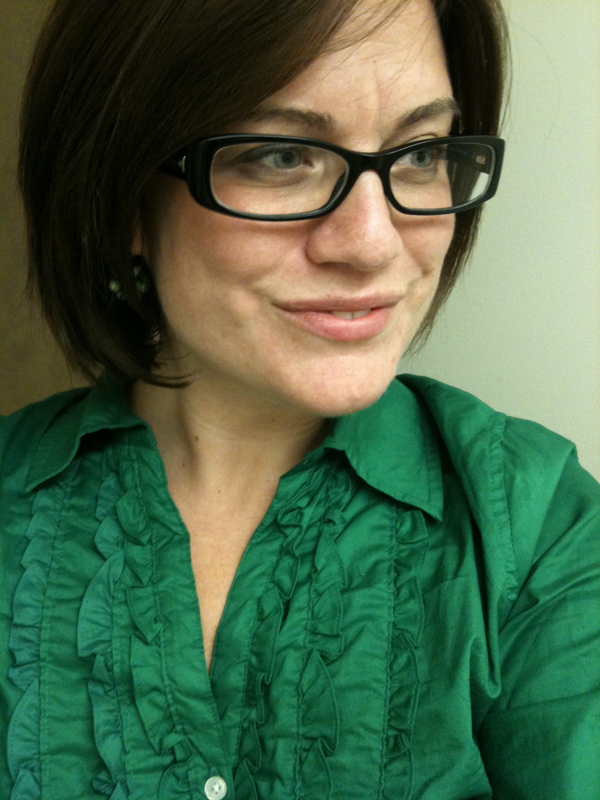 I’ve lost 10 lbs over holidays, so it’s not weight gain. Oh well. Whatever. 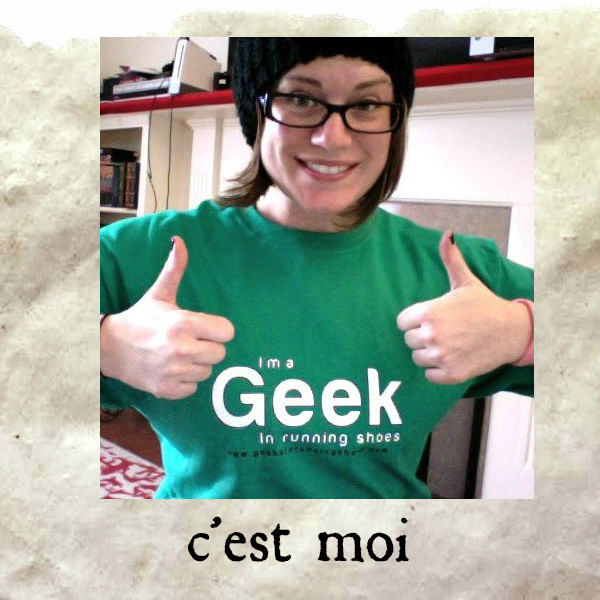 I’m outside running, in any case. 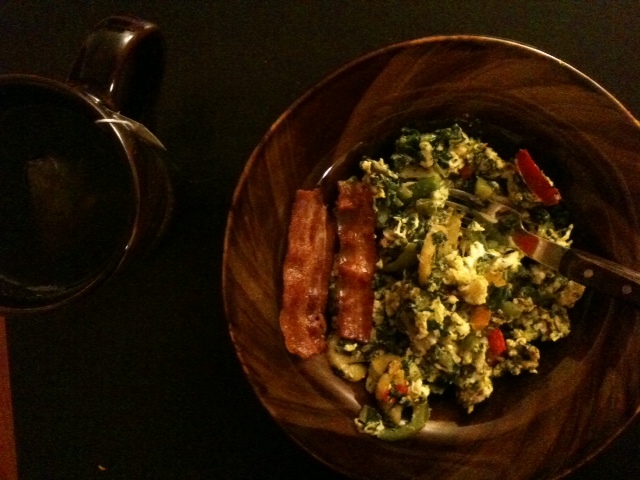 2 pieces of bacon, 2 eggs scrambled with spinach, chopped shallots, red, yellow & green peppers. Breakfast: 2 pieces of bacon, another amazing 2-egg scramble– all scrambled in the bacon grease! YUM! I did scramble in a few potatoes & some tiny pieces of green bean (was trying to get rid of a bag of frozen stuff from Trader Joe’s). I’m not going to lose sleep over it. Lunch: some sweet potatoes mashed, some steamed vegetables & pulled pork. 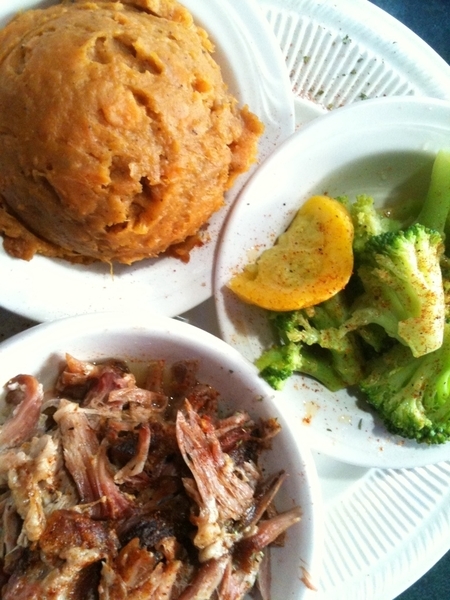 Pulled pork, steamed veggies & sweet potatoes mashed from Rub BBQ. Snack: (I was hungrier than normal): clementine & some pistachios. Dinner: half a chicken. No lie. Flame-broiled chicken, no less & no more. No salt, no extras… but still… that’s a lot of bird. I’m really full. Overdid the eating today. Had 2 glasses of red win at book club tonight. It was delicious. The company excellent. This entry was posted in Paleo Challenge, Running, Weight Loss and tagged paleo, paleo diet, resolutions, running, weight loss on January 6, 2011 by Molly.